At The Idle Man, we are often thinking about what we would do if we won the lottery. One thing we would do immediately is invest in a brand new pad. That said we have spent some time trawling the Internet for the best penthouses in the world. Here are our top picks. Across the world there are some incredible houses and apartments on offer and if you have the money, the world is quite literally your oyster (sorry to use such a cliched phrase). We here at The Idle Man are big fans of all things architecture and interior design, so we have decided to scope out the best of the best and compile a list of the most incredible penthouses in the world. Below you will find some of the best top floor apartments across the planet, ranging from ones in Los Angeles to New York and everywhere in between. We hope this does not evoke too much envy and you can continue with your day accordingly. When this 6941 square foot home went on sale in 2017, it had a record asking price for the neighbourhood in which it sits - it was priced at $42 million. It sits at the top of 181 Fremont and occupies the entire 70th floor, offering undisturbed views of the Golden Gate Bridge and the Transamerica Tower. It has five bedrooms, five bathrooms and residents can boast that they have sunset to sunrise views, on either side of the apartment. As well as all 0f your typical amenities like a study and kitchen, the property boasts further unexpected services such as a wet bar with a wine tower, a secondary kitchen and walk in wardrobes. The master bedroom has sweeping views out towards the Pacific Ocean. Designed by Orlando Diaz Azcuy, the home is undoubtedly one of the best penthouses in the US. This is undoubtedly one of Los Angeles' best luxury penthouses, and to say that is a big deal, seeing as it is the land of the rich, famous and ridiculously swanky homes. This penthouse apartment, situated in Downtown Los Angeles, is one of the city's priciest new opportunities. However, it is not for sale, but can be rented for a staggering $100,000 a month. This may seem like a steep amount (it is), but you are getting 18,000 square feet of property in one of the most popular cities in the world, so it kind of makes sense (kind of). The penthouse apartment occupies the 34th and 35th floors of Level Furnished Living, a hybrid luxury hotel and housing high-rise in Downtown LA, which opened in 2015. The apartment has four bedrooms, 10 bathrooms, and four kitchens, temperature-controlled wine rooms seen through 10 foot glass walls which can hold about 1,000 bottles, a media room which can accommodate 15 people, while the dining room seats ten and the kitchen 16. 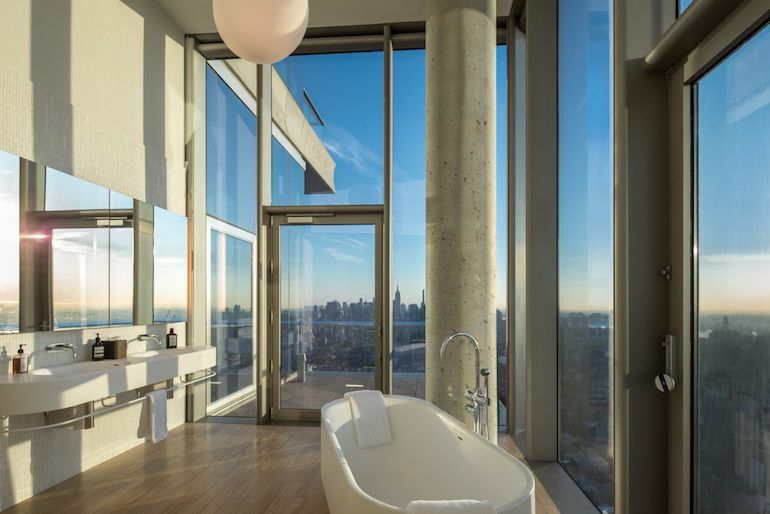 The penthouse's master suite features a 480 foot walk-in wardrobe and walk-in shower. The interiors of the penthouse have been expertly crated and a mixture of herringbone and marble have been used throughout, while staircases reach up the 30 foot high floors. The top floor boasts a 50 foot private rooftop pool with a sundeck and a 12 person hot tub, where there is also an 18 foot indoor bar and an outdoor fireplace focused lounge. This is London's most luxurious property, which is saying something seeing as London is probably the most sought after place to live right now. The property was sold to an unnamed buyer for $237 million, and the building itself now stands as the most expensive apartment block with sales of over $3.37 billion. Apparently the price of the finished penthouse averages at about $295 million. One Hyde Park, located in Knightsbridge, is adjacent to Hyde Park and the Mandarin Oriental hotel. Security in the building is quite literally second to none - there are panic rooms, bulletproof glass, and guards trained by British Special Forces, according to Vanity Fair. As well as being the most expensive apartment in the world and one of the best penthouses in England, it is unarguably one of the best designed and best furnished properties on the planet. The two-floor apartment in the One Hyde Park, Knightsbridge block has floor-to-ceiling windows, its own car park and access to a host of spas and squash courts. The penthouse takes up the eighth floor of one of the nine-storey pavilions and offers views over Knightsbridge and Hyde Park. Other extras include a 24-hour concierge service provided by neighbouring hotel The Mandarin Oriental, a private cinema and wine cellars. Originally a 30-storey structure designed by Sir Richard Seifert in 1972, the finished building actually stands at 41 stories and offers 191 luxury apartments. The building allows properties to have expansive views across London, overlooking the London Eye and The Houses Of Parliament. The unrivalled apartments offer a new height of luxury living in the city and their light, spacious interiors are a perfect canvas on which to project your personal style and taste. Two of London’s leading interior designers were invited to draw on this inspiration to create distinctive apartment concepts – duplex apartments designed by Dara Huang at Design Haus Liberty and lateral apartments from 1508 London. The concierge service at the Southbank Tower is second to none. Hugo Peña, formerly of the Savoy and Four Seasons, is the head of Consort24, the bespoke concierge brand that has been set up solely for the residents at South Bank Tower. There is a cool 20 metre pool and gym with full-time trainers on hand in the basement, while on the 10th floor there’s the residents’ lounge, with panoramic views and a private cinema. Residents here can also take advantage of a room service from Mondrian London, one of London's best hotels in next door’s Sea Containers House. There are four penthouses – two duplexes, two laterals – at the South Bank Tower and they are undoubtedly some of the best penthouses in the UK, if not the world. Their sheer scale (the duplexes are 4,135 square feet, not including the private terrace), vast expanses of glazing and price tag (£25 million if you want the full designer treatment from either Design Haus Liberty or 1508 London) make these some of the most sought after properties in the world. For us, these take home the best penthouse design award (if there was one). The penthouse at 432 Park Avenue is the highest residential spot in the Western Hemisphere. Towering up to 1,396 feet, the skyscraper offers 104 apartments at 30,000 square feet each, but the real diamond is the penthouse. Rafael Viñoly designed the tower and it took three years to construct. 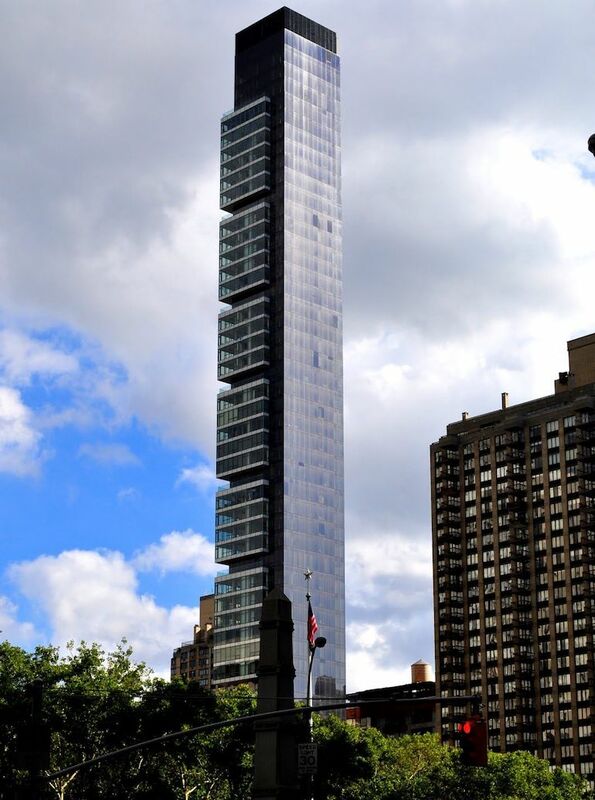 The penthouse sits on the 95th floor and is the highest residence available to be purchased. 8,255 square feet, with six bedrooms, seven bathrooms, 12 feet ceilings, a wood-burning fireplace, two powder rooms, a large library, and room for a grand piano. 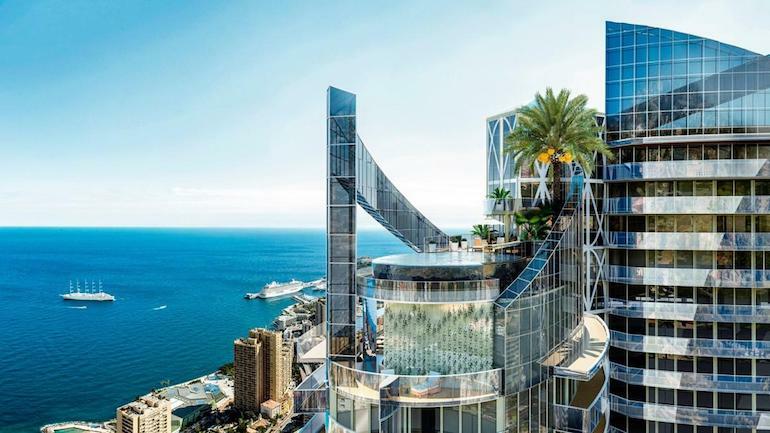 When it comes to luxury living, nothing quite tops the almost-finished La Tour Odeon in Monaco. Now the principalities highest building, the 49-storey skyscraper has unrivalled views across the Mediterranean. After five years of building, the glass and metal building is one of the finest places to take up residency in Monaco and the penthouse at the very top is quite naturally the jewel in its crown. Located in Monte Carlo, with Larvotto Beach and the Ligharian Sea at its foot, the penthouse is the epitome of French Riviera luxury. The five-floor penthouse was designed by the Monegasque architect Alexandre Giraldi and the 31,500 square foot, five-floor residence occupies the 45th through the 49th floors of the Tour Odeon. The apartment includes a rooftop deck and pool, which we can safely say is unrivalled across the Mediterranean. This has its own water slide that descends one story from the dance floor directly into the infinity pool, because why not?! As you can expect, New York City is home to some of the best apartments in the world. 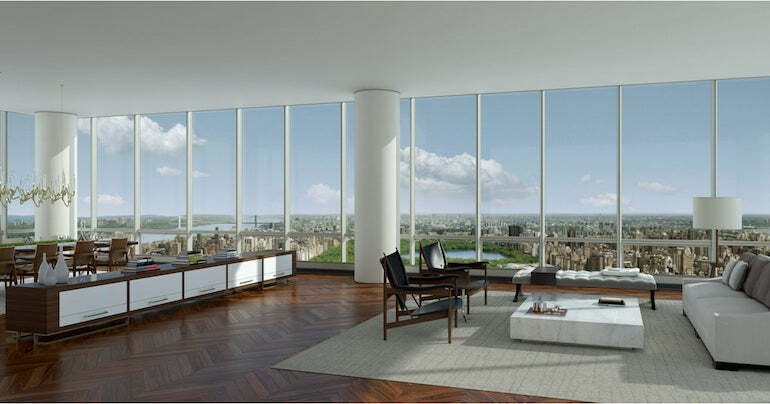 The apartment atop One57 is one of the best penthouses in New York. Located on the 89th and 90th floors, the penthouse is 11,000 square feet, has six bedrooms, a steam room, a library, and an indoor movie theater. 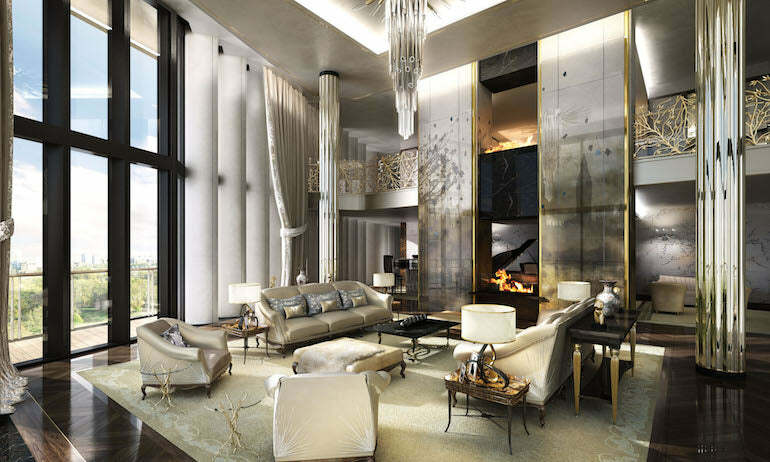 As seems to be on trend with a lot of the best penthouses, residents will also have access to the amenities in the Park Hyatt hotel, which takes up the first 39 floors of the building. Yet if this is not what they fancy, One57 owners can also use their own 20,000 square foot amenities floor, complete with a pool, gym, library, and theatre. The penthouse reportedly sold for $100 million, making it one of the most expensive buys ever in New York City. The owner remains a mystery. Singapore's Tanjong Pagar Centre has become the tallest tower in the city and has actually been labelled a vertical city itself. It has 181 exclusive residences located from the 39th to 64th floors and it is rapidly redefining Singapore’s skyline and taking luxury living in the city to a new level. 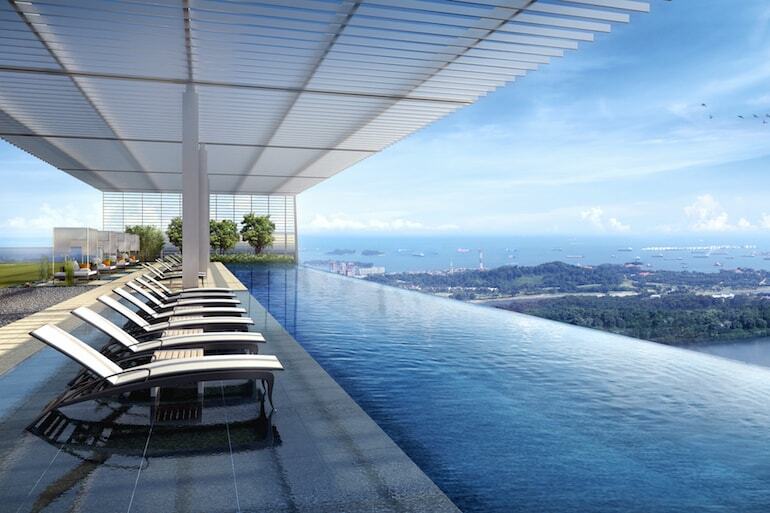 The super penthouse sits on the 62nd to 64th floor and at 21,000 square feet it is the largest non-landed residence in Singapore. It features an exclusive private swimming pool which overlooks Singapore, a cabana, jacuzzi room, bar facilities, and entertainment room. A concierge service is available via GuocoLand’s concierge team, so whether it is chartering a yacht or a private jet, or arranging a private chef to cater for a dinner party that you are after, the concierge team will make it all possible. There is an in home fitness centre, hot tub, wine cellar, 24 hour guards, a private elevator and unrivalled views of the bay. 56 Leonard is essentially changing the way that luxury is done in Downtown New York City. Set in Tribeca, it is swiftly setting records, notably with regards to the prices at which its penthouse apartments are being sold - the first was sold for a huge $47,866,945.06 (to be precise). This was the priciest sale ever south of 14th Street and has been making headlines since 2013. The Herzog & de Meuron-designed building has a number of penthouses, but at the time of writing only one is available. galleries, exercise rooms, private elevator access and direct entry open to soaring 14 foot ceilings and a great room anchored by a sculptural white enamelled steel wood-burning fireplace. 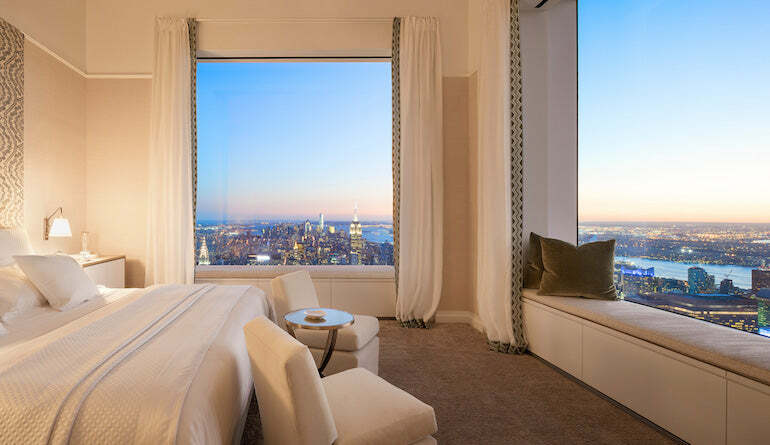 The luxurious penthouse spans the 57th to 60th floors of the One Madison skyscraper in New York City. The four level, 10,160 square foot top floor penthouse residence is unlike anything else and offers double height rooms with a wraparound terrace, providing unrivalled views of Manhattan and beyond. In July 2014, the iconic penthouse was reportedly purchased for a staggering $57.3 million by News Corp. Chairman and billionaire media mogul, Rupert Murdoch. Each room gives a unique view: admire the new World Trade Center at breakfast in the eat-in kitchen; gaze upon six of the city’s most iconic bridges from the master suite; enjoy a close-up of the Empire State Building from the dining room; and marvel at the dramatically changing landscape of Manhattan’s West Side with awe-inspiring sunsets from the media room. Above we have listed our favourite penthouse apartments across the world. While none of them are really obtainable by any means, we hope that one day we may be able to call one home. For now we can just marvel at the fact hat some people are able to call these home, from the Penthouse at the Southbank Tower to 432 Park Avenue's mega complex. For us, these are the best penthouses ever.